The Tiger Family Grows The Tiger Family is growing and Daniel learns that he is going to be a big brother! At first, Daniel isn't sure what to expect, but as his family prepares for the arrival of the new baby, Daniel learns about what it means to be a big brother...and a big helper. Daniel Learns About Being a Big Brother The new baby is almost here and the Tiger Family is getting ready for their arrival. Daniel is eager to help as Mom and Dad prepare the new baby's room, but struggles with the idea of giving up old baby things for his new sibling. He soon realizes that being a big brother means letting go of things you no longer need, and that s a big help for the whole family. The Baby is Here (Special Double Episode) The baby is about to arrive and everyone is so excited! Mom and Dad head to the hospital to have the baby while Daniel and Grandpere spend time at home going through some of Daniels old things. Daniel discovers an old bedtime book that inspires some musical play in the park-as well as big musical numbers throughout the story, welcoming the new addition to the Tiger Family. Baby Margaret comes home! Time for Daniel Daniel is playing adventure tiger at home with Dad, but things are not quite the same, now that Baby Margaret is around. Daniel is upset that Dad keeps interrupting their play to take care of Baby Margaret, but Daniel learns that there's time for the baby and time for Daniel, too. There's Time for Daniel, and Margaret Too Daniel is still getting used to have the new baby around. When Prince Wednesday comes over to play, Daniel is upset when Prince Wednesday wants to play with the baby instead of him, but he learns that there's time for the baby and time for Daniel, and what's even better is when they all play together! Playtime is Different Daniel is having fun playing restaurant with O and Katerina but they keep getting interrupted by a very curious Baby Margaret who wants to be part of the action. She also can't seem to keep her hands off of Daniel's beloved Tige-y! Daniel eventually learns that although having a new baby sister around is very different...it can also be really fun. The Playground is Different with Baby Daniel is playing "circus" at the playground with his friends, but Baby Margaret seems to be making things different. Mom and Dad encourage Daniel to find a way to include Baby Margaret in the play, which Daniel learns can actually be even more fun! Let the circus parade go on! Junior Conductor Jamboree Our kids ride the Dinosaur Train from one end of the line to the other, through all three Time Periods -- from the Cretaceous, through the Jurassic, to the Triassic. All along the way, they pick up friends who join them for a Junior Conductor Jamboree! Rocket Train Tiny and Buddy find out that a newer train will be riding the same tracks as the Dinosaur Train. The new train is called the Rocket Train, and its conductor is named Thurston Troodon, who was a former classmate and rival of Mr. Conductor. 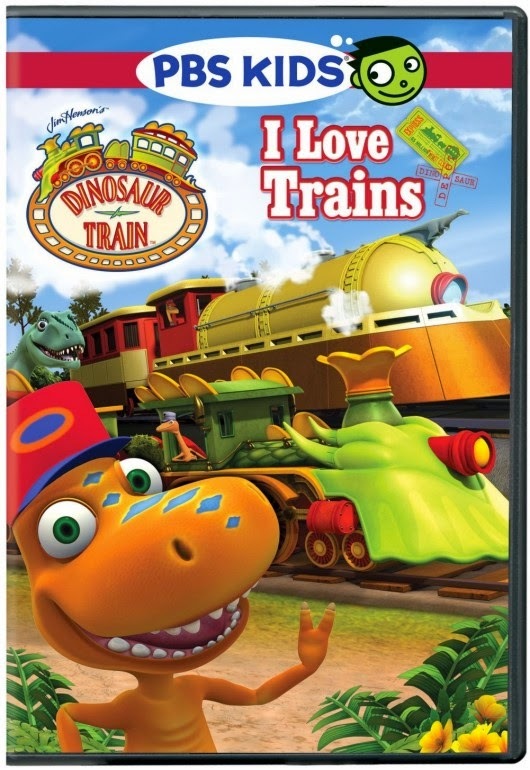 Thurston is very confident and boasts that the Rocket Train is newer, better, and faster than the "old Dinosaur Train." Mrs. Troodon, Thurston, and Mr. Conductor's old teacher, suggests a friendly train race. With Tiny and Buddy on board, the "old" Dinosaur Train ends up helping out Thurston and the new Rocket Train after it breaks down. Erma Eoraptor Buddy, Tiny, and Mrs. Pteranodon go on an expedition all the way back to the Triassic Time Period to meet Erma Eoraptor, one the first species of dinosaur that ever lived. They ride to the end of the line to find Erma, and then bring her back for a ride on the Dinosaur Train! Troodon Train The Pteranodon family rides to Troodon Town to celebrate Troodon Train Day, where the main event is a concert by King Cryolophosaurus, giving his first performance in years! When King comes down with some last-minute jitters, Buddy and Tiny help him overcome his stage fright and he sings a medley of his hits, including the Dinosaur Train theme song! Rocket Train 2: Surprise Party Buddy, Tiny and the other Junior Conductors get the thrill of a lifetime when they help drive the rocket train, and even pick up far-flung friends, gathering everyone for a surprise party for the one and only Mr. Conductor! Rocket Train 3: New Conductor Archrivals the Conductor and Thurston Troodon meet a rising star Troodon conductor -- Tricia Troodon! Tricia is an amazing designer and is sure that her new train will be the best. Train Trouble The speedy dinosaur brothers Oren and Ollie join our kids on a train trip to Troodon Town, but unplanned engine trouble sends Oren and Ollie sprinting the Roundhouse to bring back another engine to save the day! Ned the Quadruped Buddy and Tiny tour the Dinosaur Train and earn their Junior Conductor hats while their friend Ned, a four-legged, long-necked Brachiosaurus and regular Train rider, tags along. Win it: 5 lucky readers will each win "Daniel Tiger's Neighborhood: Big Brother Daniel" and "Dinosaur Train: I Love Trains" DVD's. This giveaway will end March 31st at 11:59 PM EST. The winner will have 48 hours to respond to my email. If no response, a new winner will be chosen. Open to residents of the US. I'd love to win these for my nephew. I would love to win for my children. I'd love to win this for my sons. I would give these to my nieces and nephew :) Such fun DVDs! I'd love to win these for my grandsons! I would love to win these for my 3 year old son. Both of these are shows he really enjoys! I would love to win for my grandson. The kids will love to watch these dad's. I want to win this for my son and my husband. My husband was a Mister Rogers neighborhood fanatic as a child and my son loves Daniel Tiger's neighborhood so they have something in common that they watch together and both laugh. I want to win for my daughter. My kids are obsessed with Daniel Tiger and they have not yet seen that one. I'd love to win these great DVDs for my kids. I'd love to win for my son. my daughter loves Daniel tiger!!!! Both of these DVD would be nice to have for my grandson. I'd like to win these for my 3 yoa niece. Thanks. I would love to win these for my son. He loves both of these shows. I want to win these fun DVD's for my nieces!